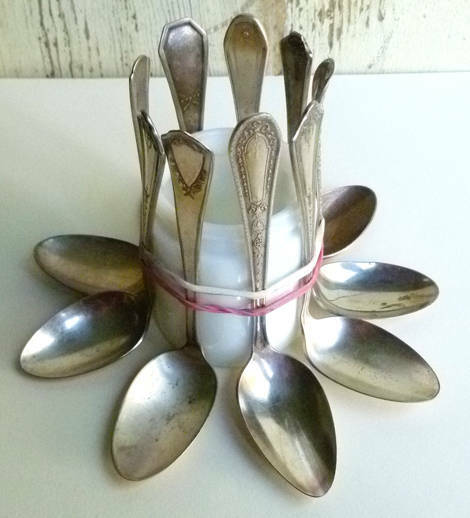 I know it’s a bit early for Easter crafts, but I wanted to give you enough time to start collecting vintage spoons, the primary supply for this easy to make egg holder arrangement. To do this project, find straight side bottles and jars. 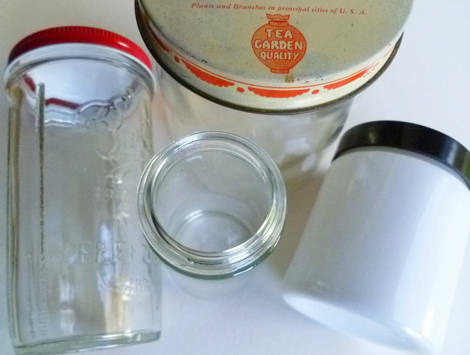 I used the milk glass cosmetic jar and clear spice bottle. 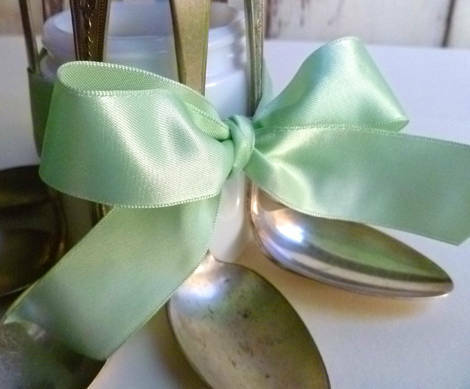 Collect various inexpensive spoons from thrift stores and flea markets (I prefer pretty vintage ones). Bend the bowls of the spoons at the neck at a 90º angle. Rubberband the jar and slide spoons under the bands, keeping in mind that if you space them too close, the eggs may not fit. and tie around the jar to hide the bands. Add pretty flowers and enough water to keep them fresh. Then add the eggs. My eggs are courtesy of the cute little Holden hens, but of course you can use colored and decorated eggs as well. 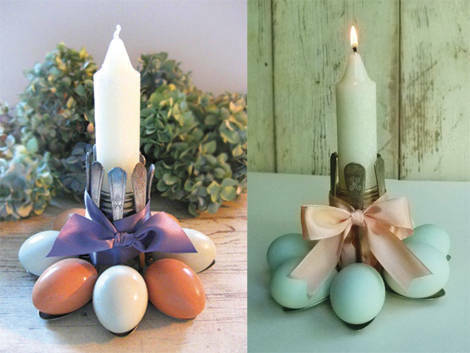 You can also make these into candle holders for your Easter table. Slip a vintage plate or platter under to make the arrangement just a bit more grand. 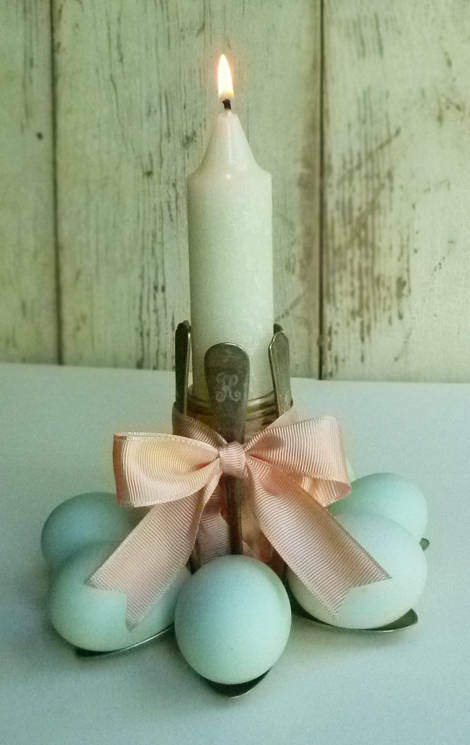 This entry was posted in Collecting, Easter, general craft, Holiday Crafts, repurposing and tagged Easter Eggs, Egg holder, Egg tray. Bookmark the permalink. Cathe, I absolutely love this idea. I’ve got a bunch of junk silver spoon about and this is a perfect idea for them. Thanks! Wonderful .. Thrift store here I come. Thanks for the great idea! they are so stinkin cute!! Oh, I REALLY like this! Very original! Thank you for the tutorial! What a wonderful idea!! – so clever and so beautiful!! Love it. THat is a super cool idea! Gonna have to do that one for sure! Thanks for sharing now! Easy and DANG cute! Time to hunt down some spoons…thanks for sharing. OMG! I can’t WAIT to make some of these! We host a huge Easter egg hunt every year and my Easter decorating/crafts were wearing a bit thin. These will be fabulous! Thank you! 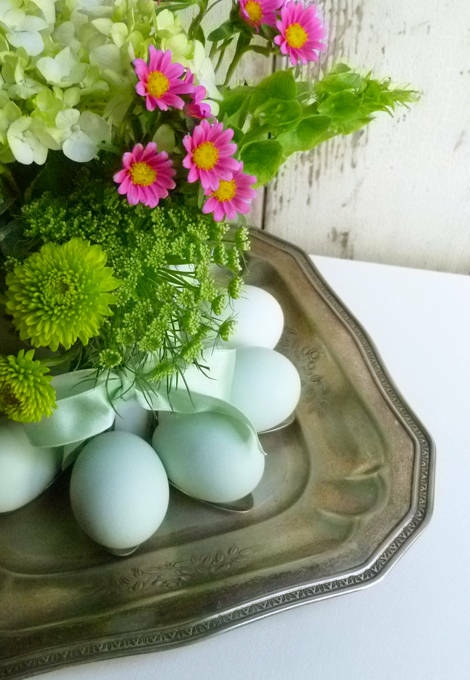 The perfect centerpiece for an Easter table! Gorgeous! I love these ideas. Thank you for sharing. 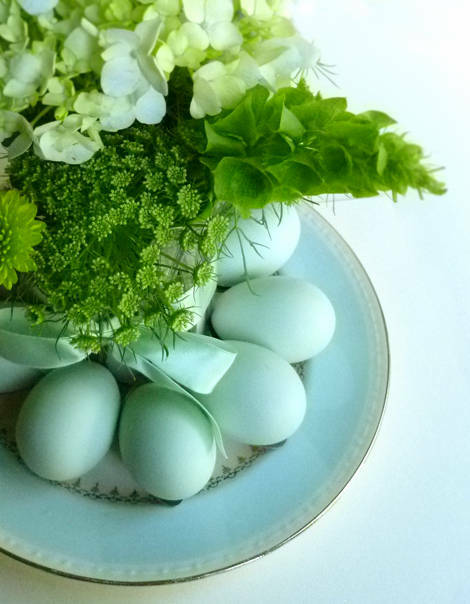 It is never too early to start thinking of easter and spring. A new follower, just figured the whole thing out! But I had been admiring your blog for quite a while.. I remember dying Easter eggs as a child. My mother would bend her spoons but never set them up in such a pretty way. Thanks for the memories. I would love to have you stop over and visit my new blog sometime, your button is added. oh how cute this is, thank you for the idea. Wow, Cathe! You never cease to amaze me! These are beautiful! If only I had kept the Araucana pullets instead of the roos I too could have had pretty blue eggs to decorate with…. long story…. I love seeing Easter stuff, it means spring is right around the corner! YAY! What a neat idea. Happy Foodie Friday! Sweet, I am helping to run a thrift store named “Thrifters Rock” for our Church and this idea will help sell all those tired spoons! Thanks for the inspiration! What a great idea Cathe! You could also put those Cadbury creme eggs in the spoons instead of real eggs. simple, beautiful, perfect. you rock the eastie bunny world! Is it Easter yet?! I just may make one for year-round. I like the way they look without the eggs too. Time to start junkin and thriftin. Thank you for sharing this idea! Thank you so much for this fantastic idea. I actually have great vintage spoons that I have been waiting to use for something, but I didn’t know what. Now I do! Thanks again. Love your blog! You ever have one of those moments when you are kicking yourself because you saw something and you didn’t buy it? I saw those little white jars the other day, tons of them, of course no where close by for a dollar each! Did I buy any, nope! Adorable idea, thanks for sharing! What a beautiful idea. I was all ready for some complicated instructions to create my own but was pleasantly surprised when it was so simple. Love love love it! Brilliant. You have been blessed with the crafty genius gene. This is so darned cute I can just barely stand it! 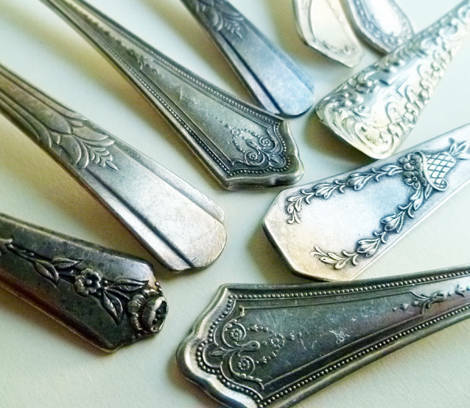 I collect vintage silverplate flatware. I am absolutely going to copy you and make this. Thanks for such a wonderful idea. Simply beautiful, and YES – so easy! Thank you!! Such a nifty idea! Thanks for sharing!! I LOVE this idea!!! I’m going to be looking for spoons at my local thrift store. Thanks for posting this Easter idea early so I have time to pull it together! What lovely arrangements! Perfect for Easter! OMG! That turned out beautifully! I will have to show it to my mom, I know she would LOVE! This is great ! I love OLD spoons ! What a sweet idea, it looks lovely! Intensely adorable!!!! Also kind of brilliant. I’m just sayin’. I love this idea and I have the spoons just waiting! Thank you,Cathe! What a clever, fun idea for using old spoons! Thanks for sharing a marvelous, creative idea! I love this idea Cathe, you are so clever ! 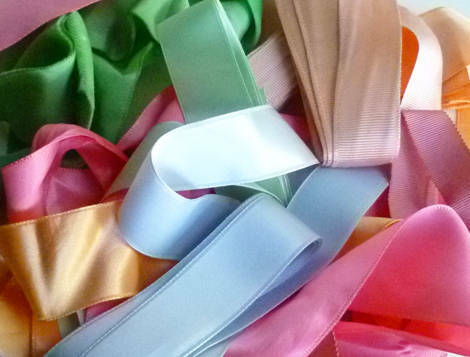 Bookmarking for spring, and posting on FB ! I thought I had seen every way to use vintage spoons but you’ve given us a fresh one! Lovely! Wow, what a great idea! And it’s never too early for Easter crafts. Thanks for sharing this! I love this! I’m going to do this! Thanks! What fun, Cathe! 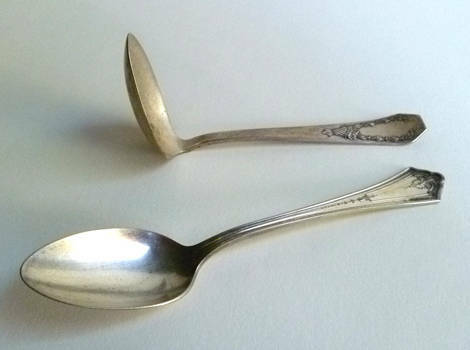 Very creative – love the different ways to use these spoons – am thinking of hitting the thrift store tomorrow and making one of these for each of my three daughters – might even make them for granddaughters as well, if I can find enough spoons. Thank you so much for sharing. Stunning! What a wonderful idea. Brilliant and absolutely adorable. It’s hard to find Easter/Spring decor that isn’t overly “cutesy.” I can’t wait to make this for myself and I may have to gift a few as well! Thank you!! LOVELY!! Such a sweet and creative idea. Will be looking for spoons between now and Easter. Thanks! love the egg holders, so creative! What a pretty centerpiece! I love how just changing from flowers to candles, it gives it a totally new look. Love both of them! This is beautiful and so original. I’m going to start collecting spoons now. Easter is one of my favorite holidays and I love your inspiration! This is amazingly unique and gorgeous…I’m REALLY inspired by this! Thanks for the inspiration … GREAT idea. I have a “stash” of old spoons … now for the bending! Love quick projects :o)! Such a fun idea! I can’t wait to make one. What a neat idea! Can’t wait to get started collecting those spoons! How original as egg holders! It is an absolutely lovely idea. ohh love that! i think i might struggle a bit bending old beautiful spoons (would feel slightly guilty) but love them…especially with died light blue egg! Your title is absolutely accurate; simple & pretty! Completely do-able! Now, the spoons I pass up because the bowl’s are too icky I’m going back for…only the lovely handles will show! I just stumbled upon your website, and I was just flabbergasted at how beautiful your egg holder is! What an imagination!!!!! Thank you for sharing that with those of us without much imagination. What a beautiful arrangement. It will surely be sitting in the middle of my Easter tablescape this year!!! Thank you! WOW! This is just about the coolest idea ever!!!! Now I need to see if I can find some awesome spoons too! Thanks for sharing! I love this! I can’t wait to put one together for the Easter season. Thanks for sharing this! I LOVE this idea!!! It is so pretty. I am totally going to make one of these to hold Easter eggs. Thanks!!! so cute, only I pity those lovely spoons …………. 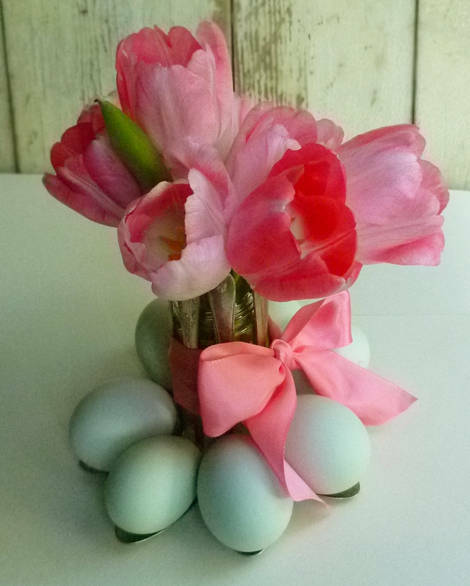 I just found your blog and I can hardly wait for Spring/Easter to make this fabulous egg/vase. Thank you for your shared inspirations. So easy and just beautiful! You are blessed with an amazing gift of creativity, Cathe! Thank you for sharing your great ideas with all of us. Marvelous! I think I may even have some spoons collected for another project that never happened. I love how easy it is (or looks anyway) yet how elegant and interesting and creative. And by the way, I also love LOVE the name of your blog! You are so darn clever! These are so nice. A great way to use mismatched silverware too. LOVE this idea and can’t wait to make one! I don’t have any beautiful silver spoons on hand, but now I’ll be on the hunt! Thanks for a great idea!!! Gorgeous! Just Brilliant,Have to make some of these to give as gifts for Easter. Thank you so much for sharing this idea with all of us! Oh ~ I love this. I will be trying this! I have chickens so I have eggs~eggs and more eggs! 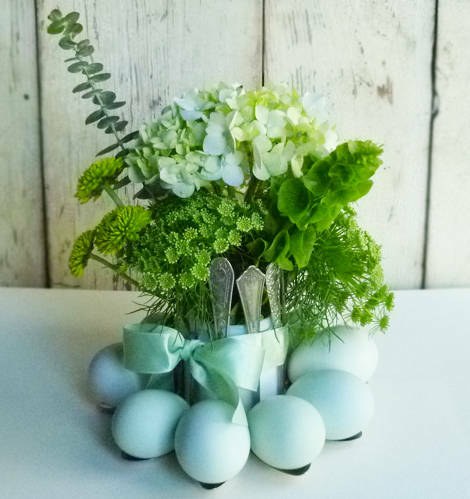 SO creative and so perfect for Easter…thanks so much for sharing the instructions and the ideas! I’m going to “pay it forward” to my friends! I thank Country Living magazine for showcasing your work. I have really enjoyed looking at all your diy projects. I am insired and have renewed ideas. Your work is amazing. Thank you for sharing your talent! Very cute cute cute idea. I am so excited to find your blog! Oh, what I wouldn’t give for a studio of my own! I love this idea! I did a kitchen shower last fall with table arrangements similar to this! 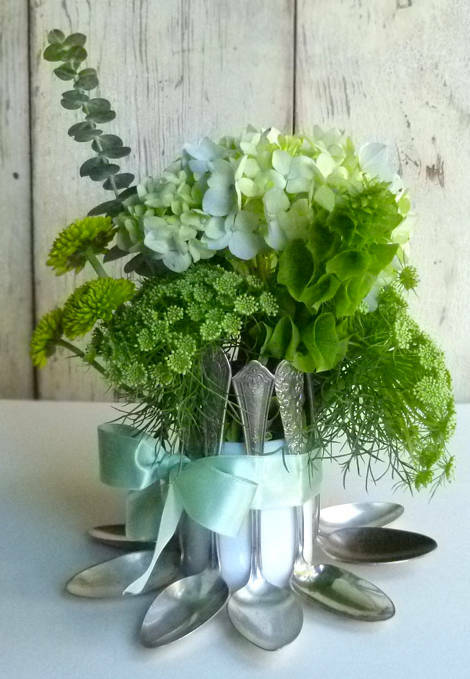 I took tall straight-sided vases and used kitchen utensils around the vase. The bride’s colors were blue and silver and I got lucky and found utensils at the dollar store that had blue handles and the working parts were metal. I used a spatula, slotted and not slotted spoons, a pasta stirrer thing-a-ma-jig, and another non slotted spatula and positioned them around the vase with the angle of the utensils flaring out at the top. I tied blue ribbon with silver glitter polka dots around the vases and filled them with blue hydrangeas. They were given as prizes for the games played at the shower. I love your blog and will certainly be visiting often for inspiration! Thank you! This is one of the best ideas I’ve seen in a long time. Such a simple, yet beautiful way to show off Easter eggs. I think it’s just as pretty without the eggs!! Oh now I have to do that project too. It’s so easy and creative, love it. For some reason this time of year I get so inspired and just don’t have enough time to make all the projects I see and think up. I love seeing all the wonderful crafts people are making. Long live crafting and using our imagination and reusing old things. Wow! So cute and creative, love your ideas! I simply love this display. It’s beautiful. Thank you so much for sharing. So cool! Love this idea. I’ll have to keep my eyes peeled at yard sales for spoons. Thanks so much! What an incredibly beautiful craft for Spring! Genius!! So pretty! And the best thing is I have everything but fresh eggs readily available. Thank you for the wonderful idea!! This is a great idea. that’s a really pretty egg holder. I love this simple elegant idea, thank you for sharing. What a wonderful and creative idea! Love the use of vintage spoons. This is an Easter idea that I will definitely use. Thanks for sharing! This such a fabulous idea! Thank you for sharing. love your stuff, fun and sweet.. I absolutely love this arrangement, thank you so much for the tutorial! Cathe, you always manage to make something beautiful out of the simplest things!